As Pat's Papers in Edmonton reports, "What if everyone flushed at once?" 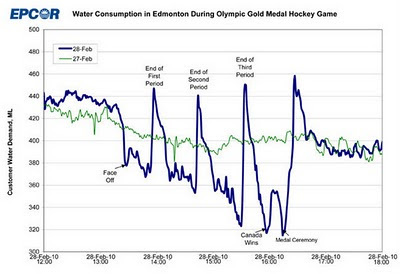 The company EPCOR released some incredible findings on water consumption during the Vancouver 2010 Winter Olympic Men's Hockey Gold Medal game last month between Canada and USA, in which Sidney Crosby scored in overtime for Canada. Water consumption during the game plummeted while everyone was glued to their seats. However, during intermissions, there were incredible spikes beyond normal levels. What this statistic shows is that Canadians love their hockey... and that argument holds plenty of water.